As part of the ever popular Discworld series, Going Postal marks the 33rd novel that takes place in the world. I love the writing of Terry Pratchett and was very happy to return to one of his novels after not having the pleasure of reading one for a long time. His passing this year was felt deeply by his adoring fans. The book is about a con man with the unfortunate name of Moist von Lipwig, which was never a problem to him because he always used an alias. That is, until his crimes caught up with him and he was given the option of a government job or death. Being a reasonable man, he chose the job figuring that the first minute no one was watching he could slip away and return to his dishonest ways. However, what he didn’t expect was a magical golem as a parole officer who could track him tirelessly across oceans if the need existed. He learns this the hard way when Mr. Pump hauls both him and his horse bodily back to the defunct post office where Moist has been forced to serve as Post Master. 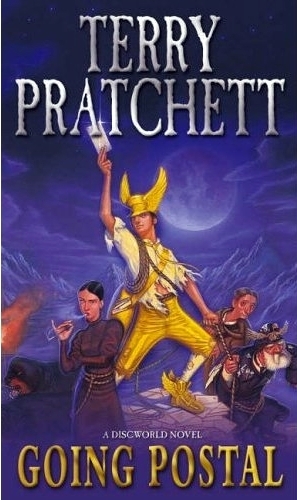 Half the fun of the book is in the unpredictable and amazing world that Pratchett has created. This post office hasn’t delivered a piece of mail in decades and the backed up mail has been stuffed into every nook and cranny, every spare office and attic space, until immense glaciers have formed. Moist is determined to make his new job work, but more importantly, he is determined to make a buck or two in the process. It is a delight to read the work of a master who truly excels at his craft. Pratchett has a knack for creating terribly flawed characters who are both charming and charismatic in unexpected ways. They are not your typical heroes or villains, but real people with real issues that are often really funny. These people are set into a fully fleshed and intriguing world where magic is real but very practical. Discworld is an amazing place and it is clear that Pratchett knows every facet of the place down to the heights of the gutters and species of birds that frequent the financial district. Prachett is talented enough to make a whole book work with just interesting people wandering around this magical place. However, he has also created a story that is both fresh and fun. There are the dark powers behind the scenes who think they have everything under control – and they don’t. There are the businesses of the post office and the clacks towers, an equivalent of the telegraph, running neck and neck against each other, and there’s Moist who is trying to make the best of it all. I give this book 5 stars – it is masterfully written and delightfully conceived.